There are several components of the Solstice product suite that should be updated when a new software version is released. This guide for Solstice administrators provides an overview of how each component is updated, as well as step-by-step instructions for the various methods for updating Pods. A current Solstice Subscription is needed to access software updates. Important note: If using the Solstice Dashboard, you must first upgrade your Dashboard before you upgrade your Pods and/or Windows Display Software licenses. To upgrade your Solstice Dashboard, download and install the latest version from our downloads page, where you can also access the latest versions of the Solstice Apps and Solstice Discovery Service (SDS). Solstice Dashboard: If you have Enterprise Edition Pods and are using the Solstice Dashboard, you must first update your Dashboard before updating your Pods. 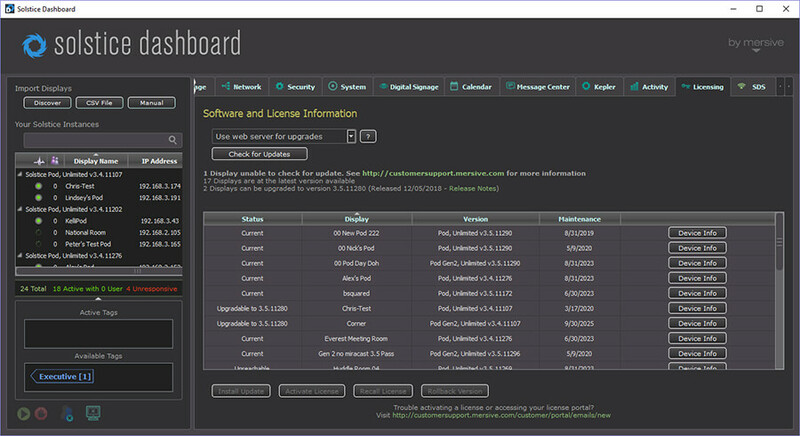 The latest version of the Dashboard is available on the Mersive Download page. Solstice Pods: There are several ways to updates Pods. For more information about the various ways to update your Pods, see the Solstice Pod Update Options section below. Solstice Windows Software: To access updates, log in to the Mersive Download Center. Solstice Discovery Service (SDS): The latest version of SDS is available on the Mersive Download page. Solstice User Apps: Users will be automatically prompted to update their Solstice Apps to the latest version when they connect to a Solstice display running the latest version. If you centrally manage your apps, or wish to manually install the latest version, you can access the all Solstice apps from the Mersive Download page (for laptop PCs) or from your mobile device’s app store. MSI for silent Solstice App installs: The Solstice Windows App can be installed via either a GUI-based install process or a silent install for all users on a machine. MSI updates can be accessed in the Mersive Download Center. For more information on MSI installation, see our MSI Instructions support article. Standard Over-The-Air (OTA) – recommended, default method. The Pod’s default update method reaches out to the Mersive web server to access updates. To use this method, Pods must have direct internet access. This method can be configured via Dashboard or a Pod’s local/web configuration panel. OTA via Web Proxy – This method can be used when Pods have internet access via web proxy. Pods will still receive OTA updates from the Mersive web server, but the Pod must have the proper web proxy settings configured to do so. This method is useful if the network requires Pods to be behind a firewall and can be configured via Dashboard or a Pod’s local/web configuration panel. Local OTA – The Local OTA method can be used when Pods don’t have direct or web proxy-based access to the Mersive web server for updates. This method requires you to download the Solstice upgrade file, place it on a local web server, and configure Pods to point to that location for updates via the Solstice Dashboard. This is only available for Enterprise Edition Pods version 3.5 or later and can only be configured using Dashboard version 3.5 or later. Solstice Local Release (SLR) – This method should only be used when Pods can’t receive OTA updates due to not having access to the Mersive web server or a local web server for updates. This method uses a local file downloaded to the Solstice Dashboard machine for upgrades and is only available for Enterprise Edition Pods using the Dashboard. This method can be configured using the Dashboard or a Pod’s local/web configuration panel. Ensure the Pod is connected to the internet via Ethernet cable or attached to an existing wireless network. Go to the Licensing tab of the Solstice Dashboard or Pod’s local/web configuration panel. Under Software and License Information, select Use web server for upgrades from the drop-down. By default, the Mersive web server is used. Click the Check for Updates button. The software will check for updates. If an update is available, select the Pods you wish to update, then click Install Update. Go to the Network tab > Web Server Proxy section. Enable one or both of the web proxy settings. Enter in the required web proxy details. To verify, click Test Proxy Settings. Go to the Licensing tab and click the Check for Updates button. The software will check for updates. This method can only be configured for Enterprise Edition Pods version 3.1.1 or later using the Dashboard version 3.5 or later. You must first upgrade your Dashboard to 3.5 or later before upgrading your Pods. Important note: In the steps below, you will receive a Local OTA zip file that will need to be extracted and placed on your internal corporate web server. The web server should be able to respond to http and https requests for the extracted files. Download the Local OTA zip file here. Extract the files and place them on your internal web server. This zip file will contain all the files needed for an update and will overwrite any previous update package when extracted to the same directory. To verify the APK file is downloading correctly: Try downloading the APK file from a web browser. If the file automatically begins to download, the download was successful. If the APK files are not downloading properly, you may need to adjust the settings of your web server to treat the APK files correctly. Ensure the Pod is connected to a network with access to your local web server. Go to the Licensing tab of the Solstice Dashboard. Under Software and License Information, select Use web server for upgrades from the drop-down. Go to the Network tab > Local Web Server section. Select Use local web server for updates. In the field below, enter the location of the upgrade files on your local web server. NOTE: You only need to do this initial configuration once. For future updates, you will only need to place the most current upgrade files in this location. This method can only be configured for Enterprise Edition Pods using the Dashboard. Download the Solstice Local Release (.slr) file on mersive.com/download. Under Software and License Information, select Use local file for upgrades from the drop-down. Click the Load Local Update File button, then browse to and select the .slr file. Once the file is loaded, select the Pods you wish to update, then click Install Update. Solstice Windows Display Software instances can only be updated by logging into the Mersive Download Center (mersive.com/downloads) and downloading the latest software update onto the Windows host PC and running the installer. Current Solstice Subscription (formerly known as “software maintenance”) is required to update Solstice Pods and Windows Display Software instances to the latest version. To learn more, visit mersive.com/solstice-subscription.